Once you’ve commissioned a Silverbrow project your designer will pass a copy of your design file to our Surveyor. He will then contact you to set up a mutually convenient appointment at your home. For our Surveyor to check that the finished room dimensions are all conducive to the proposed design plan. Also that all the gas, water and electrical services are in the vicinity of where we need them in the room and that they comply with current building regulations. If you are having building or pre works done by other trades persons, then our Surveyor will be happy to liaise with them to ensure that your ‘first fix’ is installed in the correct place. It's our final opportunity to reconfirm that you are still content with all the choices you concluded with your designer. This ensures that your expectation meets with what we are primed to supply. It also allows for any last minute adjustments you may wish to make prior to the manufacturing of the cabinets or the ordering of appliances and accessories etc. 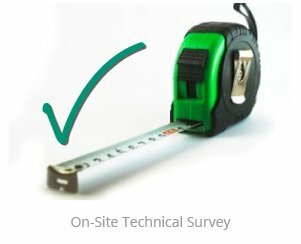 Our Surveyor will then place all the orders immediately following the survey and brief our installations team about any relevant detail arising from the survey. This process starts well before we arrive on site to commence works. Both your designer and surveyor will have passed on any information that may help the installations team. This might include notes on when you are on holiday, restricted access to your home or detailed drawings on a bespoke unit. The team then check that our suppliers return Order Acknowledgements that are not only listed correctly but are available for delivery to our warehouse two weeks prior to our delivery date to you. A member of the team will phone you the week prior to your scheduled installation to introduce themselves and to go through our booking in process. Throughout the installation, the team will liaise with both yourselves and the fitter to ensure the process runs as smoothly as possible. If any issues arise then we promise to keep you informed and updated when applicable. At Silverbrow, the whole team understands that being without a kitchen during the installation can be stressful, inconvenient and dusty! To that end, we will employ all of our best efforts, enthusiasm, experience and dedication to looking after you throughout the process.